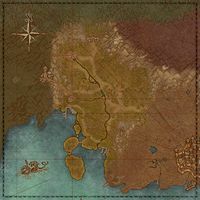 Alcaire is the western region of Stormhaven. The Alcaire Castle is found in the northwest, and the mining town of Koeglin Village is to the south. The region includes the Bonesnap Ruins and Firebrand Keep on its eastern border with Menevia. The Alcaire Dolmen lies on the tip of the largest island south of Koeglin Village, in the southwestern corner of the region. To the west is the Glenumbra gate and the gate to Rivenspire is to the north. These side quests count towards the Stormhaven Adventurer achievement. For Covenant storyline quests which also contribute to this achievement, please see Stormhaven Quests. ​ Dreamslayer 5 Defeat the Omen of the Watchful Eye and lift the paranoia in Alcaire.